The company that breathed new life into electronic learning toys has fallen on hard times. LeapFrog Enterprises (LF) may have raised the bar with its interactive reading platform and cartridge-based system that made learning fun for young children, but it's been running dry since the initial success of its LeapPad in 2011. Toddlers are turning to other diversions these days, but LeapFrog is hoping to win them back with a new fitness tracker that encourages kids to embrace active lifestyles. When LeapBand hits the market in August, kids will be able to sport colorful bracelets with color screens that engage with 50 apps. It's a big and bold move for LeapFrog, but it doesn't have much choice. Business is slumping. LeapFrog had a rough first few months of 2014. It posted a 31 percent plunge in net sales, and its adjusted net loss more than tripled to 17 cents a share. If that sounds bad, keep in mind that analysts thought it would be worse. LeapFrog's fortunes started to sour last summer when it introduced the LeapPad Ultra, the third generation of its LeapPad line of learning tablets. The first LeapPad was so popular in 2011 that it became Walmart Store's (WMT) most popular toy placed on layaway ahead of the telltale holiday shopping season. A year later the initial supply of the LeapPad 2 sold out in two weeks. The LeapPad Ultra wasn't as fortunate, generating mixed reviews. The biggest problem for the LeapPad Ultra is that traditional tablets are too cheap now. Kindle Fire tablets are as low as $119. Three years ago, parents didn't want to hand over their costly iPads. However, now it's not the end of the world if kids have a more full-featured Android device that they won't necessarily outgrow as they would a kid-oriented LeapPad. LeapFrog hopped on the tablet trend early, and now it's hoping that it can cash in on another hot trend in wearable computing. Fitness wristbands are growing in popularity, and while the market is dominated by Fitbit, Jawbone and to a lesser extent Nike's (NKE) fading FuelBand, no one is trying to corner the children's market. %VIRTUAL-article-sponsoredlinks%LeapBand has a shot. 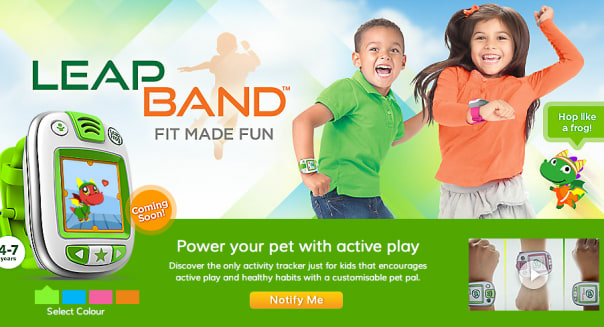 Every $39.99 LeapBand comes with 10 preloaded apps, access to another 40 free downloads and a virtual pet that kids can engage with as they score points earned through physical activity. LeapBand features an accelerometer to track motion, and it doesn't hesitate to offer fun commands like asking wearers to hop like a kangaroo or wiggle like a worm. There's plenty riding on this, but LeapFrog isn't loading on ammo. Despite the market's lukewarm reception to the LeapPad Ultra, it will introduce a couple of new tablets later this year, including one that it hopes to sell alongside other traditional tablets at consumer electronics departments. There's also LeapTV, a kid-friendly active video game console system for kids. All it would take is one big hit for LeapFrog to resume its growth, and for now its best shot appears to be the LeapBand. We'll find out for sure if kids do in fact enjoy wiggling like a worm, but if they don't, it may be LeapFrog that's doing the squirming. Motley Fool contributor Rick Munarriz has no position in any stocks mentioned. The Motley Fool recommends and owns shares of LeapFrog Enterprises.